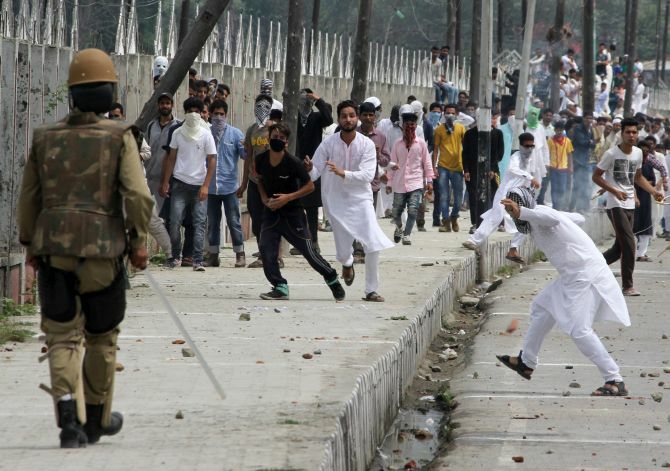 An 18-year-old youth was killed on Saturday after being hit by a tear gas shell fired by security forces to disperse a mob which indulged in stone-pelting in Zainakote area of the city, officials said. Clashes broke out between protestors and police personnel in many places in the city as youths stoned vehicles carrying people to the rally of Prime Minister Narendra Modi here. Gowhar Ahmad Dar, a resident of Zainakote, was hit by a tear gas shell on his head near his house on Srinagar-Baramulla road on Saturday afternoon, they said. The youth was rushed to SKIMS hospital at Soura in critical condition, where doctors conducted a surgery on him but he succumbed to his injuries, officials said. Officials said stone-pelting incidents were reported at Singhpora and Pattan in Baramulla district, Panthachowk and Frastibal near Pampore in Pulwama, Channapora, Narbal crossing and Parimpora in Srinagar. Seven persons, including two police constables, were injured in the stone-pelting incidents, they said. Some vehicles were also damaged in stone-pelting in different parts of the valley, the officials said. Authorities had imposed strict curfew-like-restrictions in the summer capital Srinagar ahead of the prime minister's rally and a call for a march and a rally by the separatists. All roads leading to the stadium had been barricaded by coils of razor fitted wire. The independent MLA Engineer Abdul Rashid also led a protest march in the city. He was, however, detained by the police along with his supporters.